This is Kip, an energetic little ball of fire. Kip was born in Brooklyn, but recently his dad's job as a tech executive required relocation to Seattle. Since Kip's nose prevents him from flying, Kip made the cross-country journey by car, escorted by a private driver. Dad, meanwhile, crossed the country by motorcycle. I drew this for Kip's mother, who commissioned the portrait as a Christmas gift for Kip's dad as he celebrates his first holiday season in the Pacific Northwest. Kip's priceless expression makes this one of my favorite dog portraits. Cash is a German Shorthaired Pointer who is five years old but acts like three. He’s extremely energetic, and just flies when he runs. Cash is adept at hunting, and never has a problem sniffing out families of mice and rabbits. He lives in the Connecticut countryside with his family, which includes two little energetic girls who he never has a problem keeping up with. Meet Cooper, my 10-year old hound dog. This drawing is based on a photo I took on July 4th, when the residents of my Brooklyn neighborhood love to shoot off explosives, all night long. I had just returned home to find Cooper frenzied. This may look like a smile, but moments later he took off running high-speed through the building hallways fueled by firework-induced adrenaline. 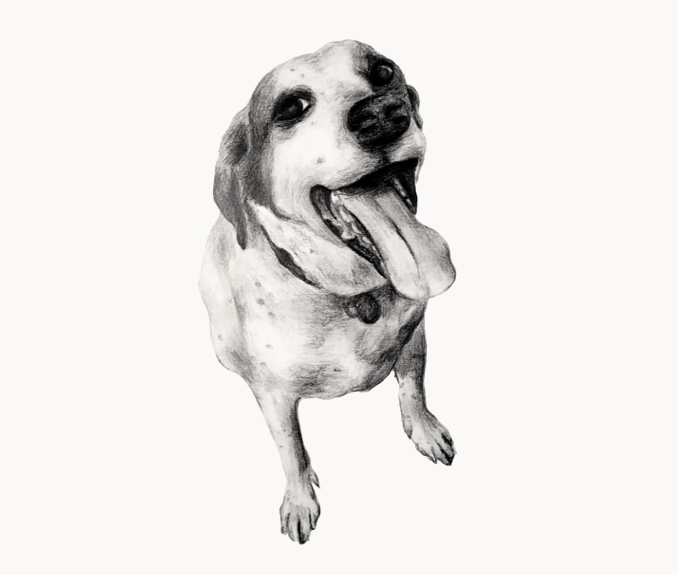 A special moment, captured for posterity in this dog drawing. Pugs. I love those good natured, energetic, sturdy dogs with crazy good looks. Despite the snorting and the snoring, they love to cuddle up on the couch and be your best friend. And their expressions make for fabulous dog drawings. This is Cooper, Golden Retriever living in the Pacific Northwest. His mom took this photo when he was just eight months old, eagerly waiting for a treat. 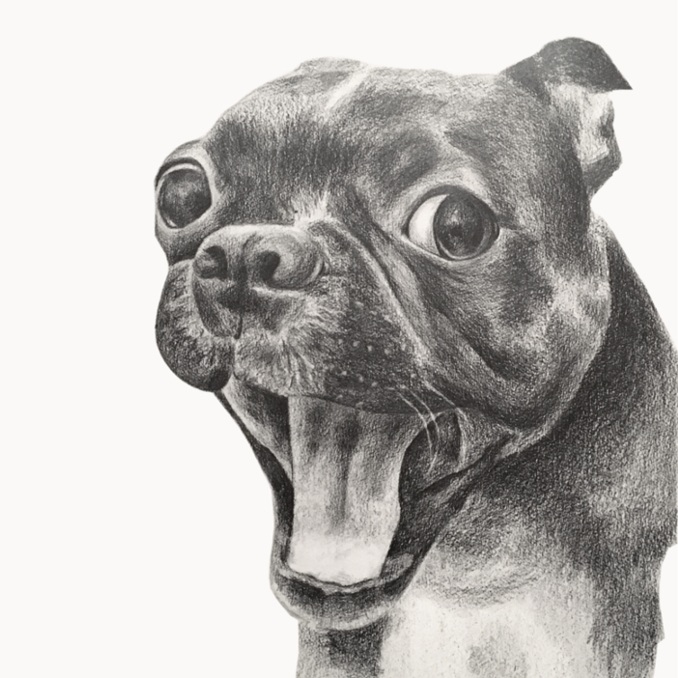 Cooper’s excited post and animated expression make this another one of my very favorite dog drawings. 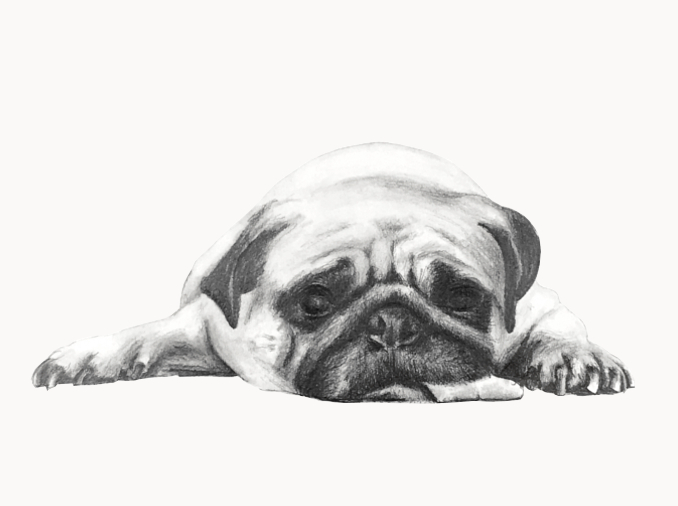 This is Nina, a beautiful dog I drew on commission for her mother. Nina had a hard life until her loving mother rescued her, adopted her, and gave her a home. Despite her mother's best efforts, Nina could not be socialized in a way that would prevent her from being a danger to others, and she had to eventually be put down. 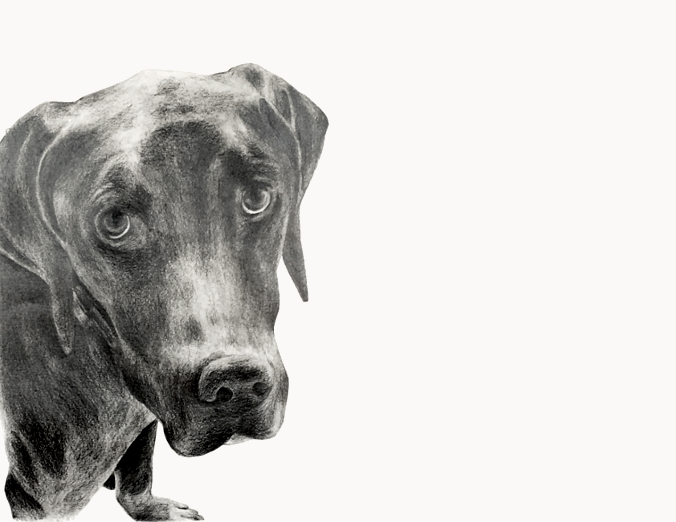 This is one of my favorite dog drawings, because it gave her mother something by which to remember her lovely Nina. This five-year old Brooklyn resident is a bundle of energy who loves long walk through Park Slope and some occasional off-leash time in Prospect. In my Brooklyn neighborhood, pits outnumber any other breed by a large percentage. In years past, my neighborhood was known for its fighting rings, and some long-term residents are still scared of pits. But looking around today, I see owners who raise dogs with kindness, producing dogs with kind demeanors who look back at me with loving eyes. 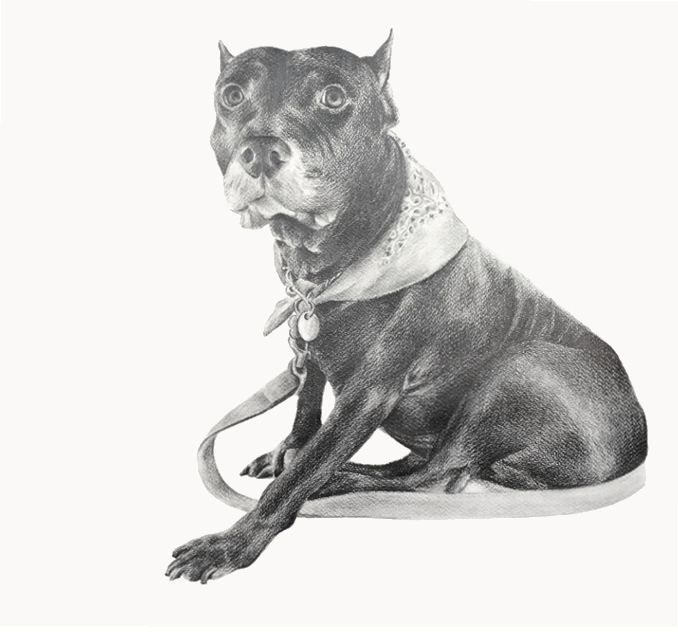 This dog drawing was done to pay homage to the lovely pits I see around my neighborhood every day and the owners who adopt them from shelters and give them good homes.